This loaf was overnight retarded in the fridge - so it was difficult to be sure if proof level was correct. I didn't quite get the loft I hoped for - and the loaf had poor/no ears. Looking closely there seems to be a small compacted layer just above the base, so just wondering if this is considered to be underproved? ...a degree of compression on the base as the gases are unable to expand downwards. I think that's a lovely loaf. 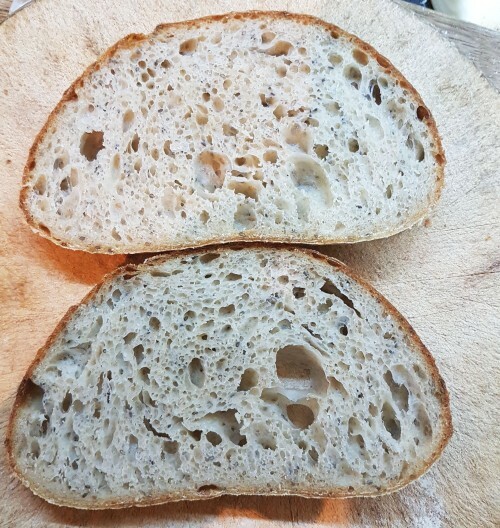 I guess I have a tendency to focus on the "improvement points" rather than the fact that actually it's a rather nice loaf! Especially in the left lower shoulder (?) where the shape curves up. And have to say I don't know. I would be speculating but first guess is that the dough might have dried out there a bit too much during the retard. Moisture could have been removed by a banneton unevenly, perhaps a wet banneton with dryer sides than bottom. Drying them upside down on a rack between bakes might help if that's the cause. Perhaps less time in the banneton. Perhaps the dough went too early into the shaping. Retarding usually gives me lots of tiny bubbles everywhere in the dough so I'm surprised to see it. I'm thinking along the lines that yeast gas bubbles weren't allowed to form or expand in that area of the dough and what could be causing it. How was the banneton placed in the fridge? Could condense water be dripping onto the dough? Plastic banneton with cotton liner and shower cap, so I don't see any issues there. Next time I might try 30 mins room temp proof before retarding. In your bulk, what sort of percent volume increase do you look for? I tend to think it's proofed really nicely. Maybe the bottom is denser thanks to a large cold loaf hitting your stone (or Dutch oven etc) hard to say really but otherwise, great loaf ! Thanks Geremy, it's my new "5 Sevens" (TM );) formulation: 7% each MM wheat, rye, spelt + 7% Sem Rim + 7% toasted chia & amaranth seeds, 50/50 mixed. The rounded shoulders at the bottom would be missing if overproofed -- the bottom would be flat and dense, with sharp corners where it meets the stone. I probably would have taken it a little further, and scored more deeply. The way it arches up at the bottom might indicate too much moisture in the finished loaf, letting it contract while cooling. As an aside, I'm finding that shower-cap-on-banneton holds a little too much moisture, so I don't get enough of an easily-scored skin where it's in contact with the liner; covering with a cloth seems to work better for me (and give me a better ear). to be perfect but it is more likely a scoring issue. Take some time off and get this in the oven at 90^ proof for a bread like this one. I think it went in at 97.25% because you were sleeping :-) That is why I quit doing a shaped retarded proof. It was always over proofing as I slept. With a bulk retard this is never a problem, it just over proofs as I am not watching it now!